The QuakeCon 2018 gameplay reveal for Doom Eternal is here. The folks at id say they want the Doom Marine to be its most powerful hero ever, and the gameplay snippets they showed certainly support that assertion. Appropriate, because this game is definitely going Hell on Earth. Doomguy’s got a whole bunch of new weapons, and blades nearly everywhere. There’s a retractable knife attached to his wrist, and even a blade stuck to the super shotgun. There’s almost too much to keep track of, but one item that makes a big impression is shoulder-mounted flamethrower. Perhaps the most notable addition are a whole bunch of movement options, including the Meat Hook tied with that shotgun blade – it essentially means you’ve got a grappling hook and some light parkour elements. At one point, the player jumps over a gap by swinging under a hanging pipe, at another, he climbs up to a new area by crawling along a climbable path. There even appears to be a quick boost dash ability. It’s the hook that promises the most fundamental changes – you can use it to quickly close the distance and blast enemies in the face, and there’s even a moment where the player swings from a floating enemy to reach a new location. We’ve also got some of that bleak humor Doom 2016 managed to sprinkle in, with a voice coming over the air to remind you that “Demon can be an offensive term” – so “mortally challenged” is preferred. 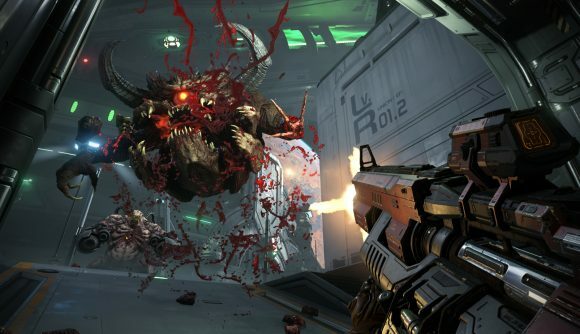 Keep an eye out for the Doom Eternal release date – we’ll keep you updated on everything we know about the new game as we find out.